Jay Monroe is chairman and CEO of Globalstar Inc., one of the world’s leading mobile satellite service providers. He is founder of the Thermo Cos. and has held the chairman position at Globalstar since Thermo’s acquisition of the company in 2004. He was originally appointed Globalstar’s CEO in 2005 and primarily manages the company’s long-term strategic growth. Since becoming CEO, he has launched several major initiatives, including the launch of the company’s second-generation constellation, to extend the quality and reach of Globalstar’s service and expand its portfolio of voice and data solutions. Monroe has been the majority owner of the Thermo Cos. since the group’s founding in 1984. He has overseen investments and operations in a wide variety of companies at all phases of growth from startup through maturity. 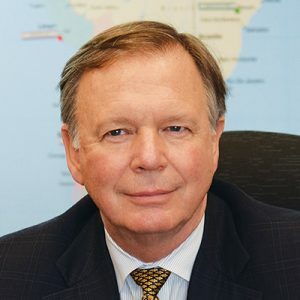 Under his direction, Thermo founded or acquired companies in diverse industries including telecommunications, power generation, natural resource development, industrial equipment distribution, equipment leasing, real estate and financial services. Monroe is a graduate of Tulane University in New Orleans.